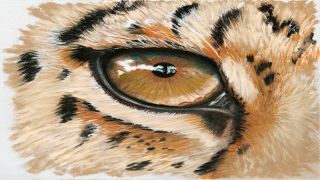 Master the key skills for drawing any animal’s peepers in a realistic way, using pastel pencils. When learning how to draw animals, one tricky aspect to manage is the eyes. There are some critical – yet simple – steps and techniques to follow that will improve your artwork. Because the viewer of your image will be drawn to the animal's eyes, you need to depict them correctly. It's a good idea to practice sketching different eyes to become familiar with their structure. Draw what’s there, rather than what you think should be there. Here we'll walk through the key considerations to make when drawing feline eyes. In this case we're drawing a leopard, using pastel pencils on Clairefontaine Pastelmat, but these same principles will apply for drawing the eyes of most animals. Once you've watched the video above, use our written steps below to help you draw your own realistic animal eyes. Being aware of the eye’s anatomy will help you understand where everything should be and what happens to the fur or skin covering that area. For example, the lacrimal gland over this eye will cause the fur to curve up and over it, ridging slightly to form the eyebrow and giving a shadow underneath it. Reflect that when you add the fur. This sketch shows how the underlying structures influence form. Remember that the eyeball is a sphere, and not a flat disc with the top covered by the upper eyelid. Check the pupil placement on your reference image, as it’s tempting to place it in the centre of the eyeball portion that you can see. Here, use a paper stump to smudge shadows under the lower lid. You’ll only see a perfectly round white-dot reflection if the eyeball is reflecting a cloudless sky with a bright sun. Typically, the reflection will contain trees or similar structures, as is the case in the example here, where there's blue sky at the top and a band of white cloud reflected in the iris, filled in with a range of ochres. At this point you can add in the surrounding texture – in this case, the fur. The comparison helps to gauge the strength of the colours in the iris and to adjust the values correctly. You’ll also be able to see where the shadows and highlights need to be deepened or lightened – typically on the eyeball under the brow, and in the corners. This article originally appeared in Paint & Draw magazine.